Origami food sounds awesome! Evil Mad Scientist Laboratories made crispy wonton paper cranes. I also like the egg in a blanket / egg in toast by Hungry Scientists. This summer would be a great time to get back into food experiments. Stumbling on Happiness by Daniel Gilbert is a book that I have wanted to read since this summer. Alas, I have not yet. But the psychology of happiness, sometimes referred to as well-being, fascinates me. I took a graduate course on happiness in the psychology department two years ago, and the research we read (from economics, sociology, health, and psychology) was all very interesting. The most interesting things, of course, are the ones that you wouldn't expect. That you might not have guessed. For example, that the amount of money that you make overall contributes little to happiness once you are above the poverty line. Or specifically, that what affects your happiness is not having significant wealth or making a lot of money on an objective scale; rather, what contributes to your happiness is how much you make relative to those in your immediate surroundings (i.e., it's better to be the big fish in a small pond). We are overwhelmed by the paradox of choice, evident when you walk into the supermarket and can choose from 20 different types of chocolate chip cookies, 50 types of cereal, or 30 different flavors of jam. Given so many options, it seems as though a buyer should naturally be able to find the choice of his or her liking. Yet an overabundance of choice can be demotivating, increasing the likelihood that the buyer to leave with none. Forty to fifty percent of the variance in happiness (referred to by the researchers as life satisfaction) between individuals can be attributed to genetic factors. Marry a happy person if you want happy kids. That we are poor at estimating the effect of life changes. We believe that paraplegics must be very unhappy. We believe that lottery winners must be overjoyed with their lives. In actuality, a year after the event, their happiness is the same. Gilbert mentions the last example in his TED Talk I recently heard. He also talks about the fact that people tend to have biases against synthetic happiness (the kind our brain seems to make by itself) compared to natural happiness (that which appears to be caused by external factors), but that there isn't really a good reason to be. I hope to blog about the rest in more detail soon. After being inspired by an article in Slate, I decided to buy earplugs. Since earplugs are really cheap, I went with the foam earplug trial pack from The Ear Plug Super Store. Note for the divisionally challenged that this comes out to around 30 cents per pair. Slate also had an article on earplug effectiveness which I did not read until just now---long after having gotten my variety pack by mail. So far Elaine and I have only tried the EAR classics. They are very effective, and are easy to insert, but I find that they become slightly painful after more than an hour or so of wearing. It may just be a size issue, which I should know when I get to trying the smaller size. We finished this Yahoo! crossword with three mistakes (boxes wrong), although really I am willing to just count it as one. The correct answer for 12-down was AVER, not AVOW. And I spelled 4-down incorrectly, so that doesn't count. You can instantly check to see whether or not you have answered a clue correctly, without having to peek at the entire solution (possibly spoiling other parts of your puzzle). As you move your position marker around different boxes in the puzzle, the relevant clues are automatically highlighted for you on the side. No more wasted time searching clue numbers. Entering things digitally via your keyboard instead of a pencil (or pen, for the bold) means that all of the letters are uniformly centered in the boxes, and mistakes are a breeze -- just delete! My motivation to do a Yahoo! crossword this evening was related to our board game playing activities last night. We had guests over for some friendly Cranium. Overall, we totally rock. But on these word game category (the yellow box! ), the majority of which ask you to do RIDICULOUSLY EASY tasks like spell "catastrophe" backwards or spell "quiche" forwards, they also had fill-in-the-blank clues, of which WE DID NOT GET A SINGLE ONE RIGHT. Hence the practice. +1 to Cranium Skills. I'm pleased with myself because I was able to fix Dean's GPS which he recently gave to us. The GPS worked perfectly excepting that its USB connector had broken off. This meant that (1) you couldn't connect it to your computer, and (2) you could only power it through batteries. Fixing it amounted to soldering the connector back on, although this was not a simple procedure. The connecting wires were densely enough packed that it was difficult to make contact with only a single wire (the connector is a Mini-B), and I think that my soldering skill improved during the operation. Of particular importance is the fact that I didn't destroy any of the other components on the board during my soldering---at least it seems this way so far. In retrospect I am disappointed that I did not take pictures to document the procedure. 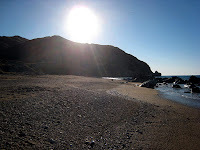 We recently returned from a short (3 day, 2 night) kayak camping trip to Catalina Island. It was a pretty last-minute trip, which we decided on just one week before we actually went. I guess this puts us somewhere between spur-of-the-moment people and planners. 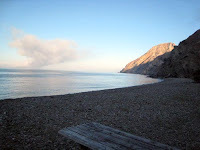 Parson's Landing is a campsite north of Two Harbors, Catalina, accessible only by moderate hiking or kayaking. Kayaking sounded like fun, and we thought we could probably manage 4.5 miles each way. Unfortunately, since it's apparently not Catalina's high season for tourists, ferries from the mainland are not as convenient nor as frequent as we would have liked. Somehow, despite some initial uncertainty about the short trip, we ended up staying at the original and an additional campground, and we kayaked over 20 miles in two days. Although we have no photographic evidence, we encountered abundant wildlife: one bison, several small lizards, a squirrel or two, pigeons, crows, seals, fish that jumped out of the water, fish that stayed in. Alex got to see the seals up pretty close. A number of them (4-6) were resting on a rock when he came from the other side of the cave, hit his kayak against some rocks, and startled the seal pack into the water. As for the trip overall, we are pretty sore, but it was a fun experience that we wouldn't mind doing again. There are a few disadvantages to not planning enough ahead of time, of course. For example, friends you invite at the last minute to join you might not be able to arrange for it to happen, much as they'd like to come. Also, you may not have time to gather information that would be useful for your trip. 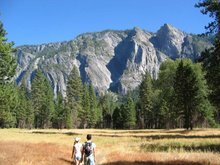 Things that require reservations ahead of time, like campgrounds, might be all booked. Finally, last minute decisions increase the likelihood that you may end up with less rational choices than you might have otherwise. On the other hand, not planning trips far in advance probably will work out just fine if you aren't trying to vacation or travel during high season (Spring Break apparently doesn't count for Catalina), you're okay going by yourselves (or yourself), you have a flexible schedule (Alex does and I had a week off), and you have some small sense of adventure. We packed food:A cooler full of food (6 bagels, 12 waffles, 6 eggs, 2 bags frozen vegetables (1 chopped broccoli and 1 Santa Fe mix), 1 bag frozen Quorn (vegetarian protein), 2 half-gallons of juice (grape and cranberry), fresh fruit (4 apples, 2 nectarines, 2 pears, 4 bananas), cheese (large block of cheddar and medium-sized block of mozzarella), bag of spinach, PB or PB & J sandwiches (6 or 7), large chocolate bar, granola bars (Nature's Valley, 4 2-packs), trail mix (2 small bags), some walnuts, small amount of leftover bread, small bottle of Gatorade, a bunch of water (filling 1 bike water bottle and Alex's 2L Camelback). It was more water than we needed to bring, especially since we got more water than we could use at Parson's Landing. We lost the granola bars (we think they were left behind at PL), we had sufficient food remaining when we landed -- a bunch of cheese, leftover and wilted spinach, some grape juice, unopened cranberry, an apple and a pear, 2 bagels, 1 waffle, some trail mix, bit of chocolate, water. We froze what we could (the juice, the water, the frozen stuff) and it kept everything else cool for a couple of days. We tried to eat the things that were most likely to suffer from warmth first (mostly the frozen goods). It was really nice to have fresh fruit. 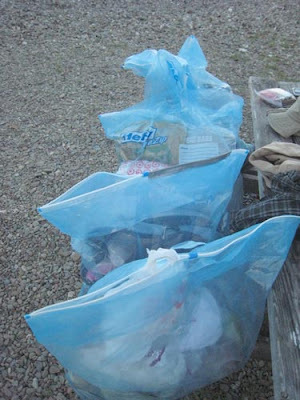 A 2-person tent, a sheet and three blankets (if we did it again, we'd get sleeping bags), clothes, GPS, two headlamps, snorkeling gear (we would have liked to snorkel, but the water seemed too cold), 2 towels, clothes, toiletries, rope, cast iron skillet ('cause I forgot to pack the frying pan! We bought it at Avalon), a cooking utensil (purchased at Two Harbors, also forgotten in the packing process), duct tape (bought at Two Harbors, was useful for repairing plastic bags), EXTRA BAGS (ziploc and plastic, which were definitely handy), and we packed all of our gear in Hefty's GIANT ZIPLOC BAGS, which we had marveled at and made fun of a whole lot before we actually needed and bought them. As a side note, one of our bags got punctured (it was set down on rock) and one of our zippers ripped (but duct tape mostly solved the problem). 10:00a Took Catalina Express from Long Beach (45 min or so crossing) to Avalon. 12:00p Took the jungle bus from Avalon to Two Harbors, w/stops inbetween. 3:30p We launch from Two Harbors, having packed all our belongings into the kayaks, and paddle northward to Parson's Landing. We stop once at a tiny beach along the way for a granola bar and trail mix snack. 5:00p Kayak becomes increasingly tiring, with moderate-sized currents and wind pushing in a direction opposite of where we're trying to go. We pass kayakers going the other way, Alex shouts and asks how far to Parson's and they say it's just around the corner. We reserved site #2, were told that people had reserved #8 -- everything else was up for grabs, but 2 looked good. Amenities at Parson's Landing: park benches at the campsites, fire rings, firewood and water that you get in a locker assigned to your site, chemical toilets, trash bins (which we did not know about in advance), and a lovely ocean view. We also found multiple grates (the kind you might want to grill on over the fire) and a fire glove near our fire ring, and someone had left 18 cents and a seashell. Day Two (3/13) - 12 miles kayakedWe had breakfast of waffles (we had made them at home and brought them frozen in the cooler -- they were smashed a bit unrecognizable for a while) and scrambled eggs. The waffles were alright, but syrup would have been nice. After packing up the tent and fitting everything back into the kayaks, we launched sometime before noon and headed back down the way we came. We braved some opposing currents and wind to check out a cave just on the south side of Two Harbors, but didn't see much because it did not go in far at all. The second cave, a little bit south of Two Harbors, was more rewarding -- we could actually pass through it. When Alex came out the other side, he spotted a number of seals resting on the flat of a rock. He said they looked shocked to see a human up so close and, startled, they quickly slid into the water. You do get to see seals hanging out now and then, though, either with you in the water or lounging on land, while you kayaking along the coast. Not too long after we passed Two Harbors we kayaked surrounded by mist. It was difficult to tell where the coast would end up ahead. As a result, we weren't sure which direction to paddle until we got closer to the land. The best parts for kayaking were the nearly still waters with barely a ripple. It's a very nice feeling to pull yourself through the water and glide. As the sun was starting to set behind hills, we checked maps and landing signs more frequently to try and figure out where we were going to stop. We were aiming for either Ripper's Cove or Goat's Head, both of these recommended by Randy when he had provided us with kayaks. Around 5:30 or so we ended up at Goat's Head. Alex pointed out that the landings and launches had gotten easier each time, although it's not clear how much this was due to water conditions or having done it multiple time. Goat's Head is one of multiple boat-in (they call them primitive) campgrounds along the coast. There are no toilets (you've gotta bag any leavings and carry them out!) and you're not supposed to have open fires (although it looked like someone had tried to create a fire ring where we stopped). Goat's Head had benches (some sites do not), and again, a fantastic ocean view. It's hard to say how many miles we actually kayaked. The distances I'm giving are estimates based on what people said distances ought to be and our GPS, which measures between points as the crow flies. We left earlier in the morning compared to the day before (we had slept around 10 and gotten up close to 7 or so). Despite waking to muscle soreness (some caused by kayaking, but some possibly related to sleeping on hard ground), I felt like the more we kayaked the easier it got. It took us a few hours, but we arrived at Avalon's Descanso Bay a little past noon. After not having seen people around for such a long time (besides passing boats at a distance), it was definitely strange to approach the bay and its large flocks of neon kayaks carrying kayakers. Kayaking Catalina Island offers some info and advice on kayaking around Catalina (and kayaking TO the island from the mainland! 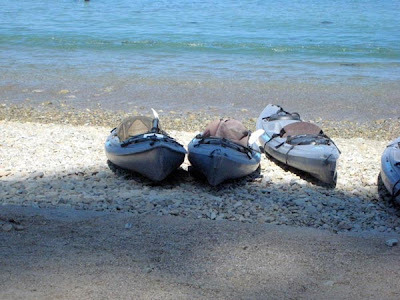 Catalina Island Kayak Camping, How to is Descanso Ocean Sports' very helpful page with pretty much everything you need to know. Also, they can rent you pretty much all the gear you might need. 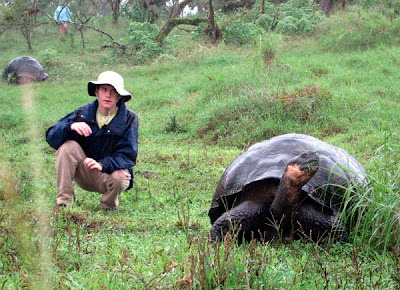 Yesterday afternoon after lunch we went to the highlands on the island of Santa Cruz to go see the giant tortoises of Galapagos. We took a bus up from Puerto Ayora for about a half hour ride to an area labeled "Tortoise Territory", privately owned land, but the owner allows people to come through in tours. The giant tortoises were amazing! We were instructed on how to approach them -- slowly from an angle, crouched down to look as small as possible, and noticing when they started to make a low hissing sound that indicated when they were concerned. I think we probably saw 15-20 of them scattered around the lush grass, and certainly there were more than those around. I liked watching them stick their heads out to grab a bite of grass, then munch away for a bit. I also liked the fact that you could tell which direction the tortoise had come from due to the flattened trail of grass they'd leave behind. The amount of tortoise leavings (poop!) on their flattened grass paths was not insignificant. It was tricky to look around and try not to step in any at the same time. Last night we had a long naviation (what they call it when the boat is moving), travelling to the west side of Isabela from 9pm to 6:30 this morning. The boat movement was very uncomfortable for Alex and myself. Alex laid down on the room floor and I was hunched and balled up in the corner. Eventually Alex puked. It had been an experiment to try the ginger as a seasickness remedy, but to no avail. At least the vomiting made him feel better afterward. 12/13/06 at 1pm, Beluga, off the west side of Isabela near Pt. Espinoza, Fernandina Is. Yesterday morning we went to Punta Morena, from which we could see at least four volcanoes that surrounded us. 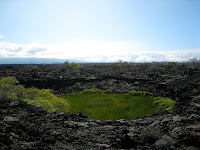 We took a couple hours' hike (walk) along a trail that took us through lava fields. The entire area was made of black lava rock, with occasional pinto tree, sedges, and cacti here and there. We also had the opportunity to view several oasises (oases? ), where fresh and brackish water had accumulated and around which trees and other greenery had begun to line. We saw in one of the oases some moorhens and flamingos. The flamingos were quite pink, and the moorhens had red beaks and parts of their faces. They all were swimming in the water surrounded by the lava-formed rocks. The pools of water were formed by air bubbles which had collapsed to form a hole where water could now collect. Towards the end of our hike there was an additional pool of water, this one filled at high tide from the sea. Here we had the chance to see medium-sized sharks swimming about in the water. According to our guide the sharks are vegetarian. If they were not, they would have had plenty of fish to eat. The waves started to get bigger as the tide was coming in. Luckily we were just leaving. After lunch yesterday -- my first time snorkeling ever! And it was great! Although, at the very beginning after we got into the water, I started hyperventilating, essentially, while wearing my snorkel mask. After a while I became more comfortable breathing, and it was wonderful to be able to look at all the fish and, for the most part, to be ignored enough by the fish so that they didn't seem to mind me swimming up. The best part of the snorkeling experience, however, was to be underwater and swimming with sea turtles. There were one or two our in the open water, and later we got to see several more swimming about in a pool. They are wonderfully graceful under the water as they glide along. And the feeling of being near them is one of great awe and great peace. Snorekeling was very enjoyable. Unfortunately Alex was freezing despite our long-sleeved underwater shirts and the shorty wetsuits we rented from the boat. He was shivering cold and explained to our dinghy driver (in Spanish) that he had an insufficient supply of bodyfat. He may have caught cold since then, sneezing a bit and having a headache. Consequently Alex did not come snorkeling today. But hopefully he will feel better and possibly snorkel tomorrow. In the afternoon we rode the dinghys and towed two kayaks into a mangrover forest. Highlights of the experience included seeing a whole lot of sea turtles all around, three penguins (one which decided to swim), several sea lions lounging on the trunk of a tree, and kayaking around for a bit. I managed to stay out of the water. Unfortunately, Alex did not. I hope that my cold is gradually getting better. I hope that Alex does not get sick. I have listened to a bit of Learn Spanish podcast and I wish I had learned more of the language ahead of time. It's so nice to be able to (I wish I could) communicate. After getting married on October 14, 2006, we took our honeymoon trip to the The Galapagos Islands, Ecuador, and Macchu Picchu, in Peru. Of course we covered some ground in-between. Our fourteen-day trip started the morning of December 10 and ended the morning of December 23. In paying Adventure Life for the trip in full (we booked after the deposit was due) + airfare and additional gear and food, we spent a whole lot more than anything we will probably pay for in awhile (at least until the housing market comes down). But overall a great experience and lots of fun. After a 2+ hour flight from LAX to Houston, and 4 hr 40 min flight to Quito, Ecuador, (10:40 pm arrival) we arrived at Mansion del Angel late last night. The Adventure Life guide who brought us, Rodriguez, told us about studies of tourism at the university, why the national currency of Ecuador is the dollar and has been for six years, and how there are plans for South America to be united under a common currency, like Europe's euro. It was chilly when we got to the bed and breakfast, as night-time weather is 10-11 degrees Celcius, around Farenheit 50 degrees. The place we stayed, where we will also stay when we return from the Galapagos, is a gem that, from the street and outside the gate, looks like nothing. Once inside, there is a lovely garden, and upon our entry I was amazed at the ornamentation and interior decor, which had themes of luxury, tradition, and what I most appreciated -- Christmas. Greens (fresh ones!) were laid out in several places downstairs. I stopped and bent over to smell them while Alex was checkin in. Pointsettia were also out in pots, as were a bowl of some reddish-orange vegetable or fruit, which I did not recognize. There are a lot of people getting on a flight now, and I wonder if it's ours. It's leaving from the wrong gate, but our flight was supposed to board ~ 15 minutes ago. It makes me appreciate the omnipresent signage in U.S. airports. At the same time, I appreciate the laid back environment here (although it may only seem that way to me). Elaine, 12/11/06 at 1:45pm onboard the Beluga, off the island Santa Cruz at Puerto Ayora. 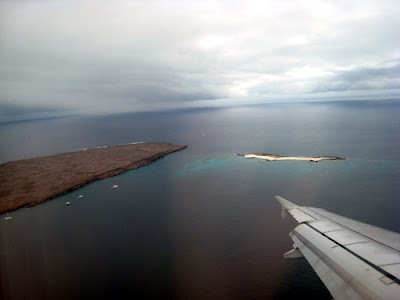 Despite Alex's concerns, we did make it onto a flight that brought us to Guayaquil's airport and, subsequently, the Galapagos Islands (Baltra). Someone from Adventure Life picked us up at the airport, I did not catch his name. Thinking now, though, he may not have specifically been with AL, but his job was to get us to our ship, the Beluga. Our first sighting of wildlife, besides some finches or other small birds near the airport, was a large sea turtle that greeted our ferry as we passed by. The ferry brought us to Baltra, and our guide person brought us in his truck to Santa Cruz. He did not seem to speak English. Alex talked to him very briefly using Spanish, but our ride was largely a silent one. From Santa Cruz we took a panga over to the boat, although not before a pleasant meeting with a small land lizard that was hanging out on the dock. It (the lizard) seemed rather slow moving and unafraid. After our arrival on the boat, we learned that most of the ship's travelers have been here since Friday, making today their 4th day. Three from the ship are leaving tonight. Our fellow travelers seem really friendly. They are mostly British, followed by U.S.-Americans, and 3 Germans, one of whom will depart the boat today. The boat is nice; in particular, it is clean. It is pitching while tied in. We will see what the motion is like tonight during what we are told is a 10-12 hour navigation. The cacti in the area surrounding Baltra remind me of dipping a wooden stick in glue, then a bowl full of cactus prickly pear leaves, as I told Alex earlier today. What you get is a rather haphazard-seeming result like this.